This is kind of chess piece in giant size. Polished well in dark green with glossy touch. Special designed and carved for outdoor decoration. The dark green will match with the green garden or the grass in backyard. Try to stand up this giant chess piece at your outdoor area, such as; garden, backyard, patio area, and another outdoor area. Unique, interesting and beautiful. 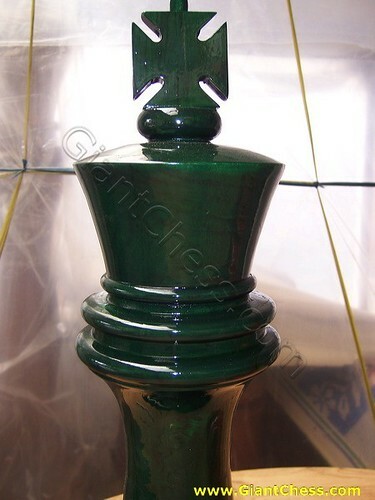 This dark green chess piece will give different touch for your outdoor area. Made from best quality of Teak wood and carved by expert craftsman. So this wooden giant chess is very durable for outdoor in any seasons and weathers. You may left it outdoor for months. Get it now and dress up your garden area. Get also in others colors if you want to make your house looks colorful.